Smugglers are the visual identity of bonfire societies in their coloured striped guernseys, and ours are red and black – inspired by our very supportive town football team, The Rooks. 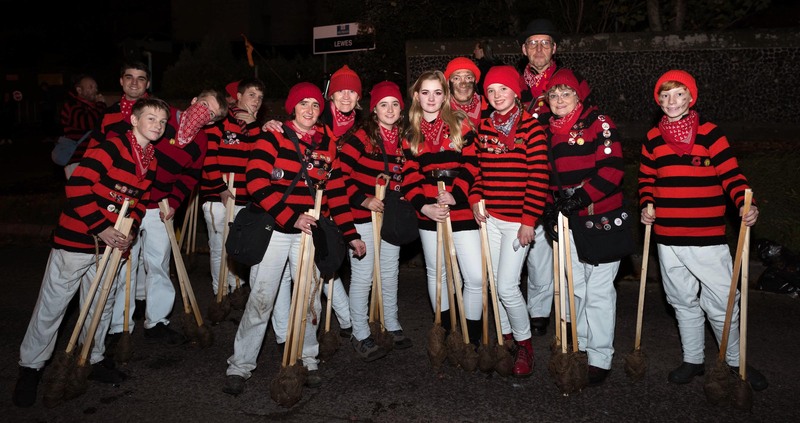 Historically, the bonfire boys and belles of old would wear a striped guernsey, white trousers, black boots, and a mask of charcoal blacked around their eyes. They were trying to avoid identification by the authorities that were attempting to stop the Lewes celebrations on the Fifth. As if!?!?! Red and black knitted guernsey. Absolutely no cotton tops, thin-striped jumpers or rugby shirts! Guernseys are often for sale via our Facebook group or you can make them using a handy and simple pattern. Download the pattern here (pdf). Alternatively, you can have one made for you by contacting Eileen Pelham 01273 478056. Red cap or beanie hat, black if you are an official. Smugglers’ accessories can include a thick black leather belt, black leather pouches or small satchels, a black frock type coat or black jacket if it’s really cold. Proudly powered by WordPress | Theme: sbsAdvance by Underscores.me.